USS Harriet Lane. Image available on the Internet and included in accordance with Title 17 U.S.C. Section 107. HARRIET LANE. The Harriet Lane, named after the niece and official hostess of President James Buchanan, was built in 1857 for service as a revenue cutter for the United States Treasury Department. The 619-ton copper-plated steamer could make speeds of up to eleven knots. Her battery consisted of three thirty-two-pounders and four twenty-four-pound howitzers. Except for her participation in the Paraguay expedition of 1858, the Harriet Lane served the revenue service until September 17, 1861. While still in revenue control, she became part of the naval squadron that was sent to reinforce the United States garrison at Fort Sumter in Charleston harbor. After her transfer to the navy, she participated in several major naval operations. The first of these was the Burnside expedition, which captured forts Hatteras and Clark on the North Carolina coast. Later the Harriet Lane served as the flagship of Commander David D. Porter, whose mortar flotilla contributed to the surrender of forts Jackson and St. Philip, at the entrance to the Mississippi. Then, after participating in Porter's unsuccessful operations against Vicksburg during July 1862, she took her station with the West Gulf Blockade Squadron outside Mobile Bay. 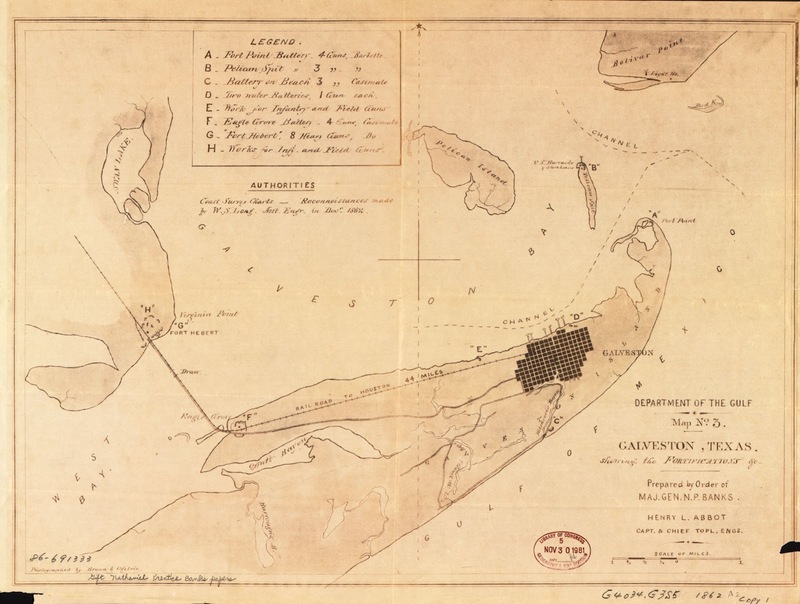 Map of Galveston during the Civil War. Image available on the Internet and included in accordance with Title 17 U.S.C. Section 107. On October 4, 1862, the Harriet Lane and four other steamers composing a squadron commanded by William B. Renshaw brought Galveston under control with their firepower. Only three months later—on January 1, 1863—Confederate major general John B. Magruder launched a surprise land and sea attack on Galveston. Three "cotton-clad" steamers manned by Confederate sharpshooters attacked the Harriet Lane, and she was rammed by two of them. Armed Confederates boarded her, and, in fierce hand-to-hand fighting, killed five of her crew, including her captain and executive officer. All of the surviving officers and crew were taken prisoner. The capture of the Harriet Lane provided the Confederates with invaluable information: aboard the steamer was found a complete copy of the United States signal-service code. Although Galveston remained Confederate until the end of the war, only a week elapsed before Galveston harbor was once again under a Union blockade. The Harriet Lane was under the jurisdiction of the Confederate Army's Marine Department of Texas until March 31, 1863, when control of her was transferred to the War Department. 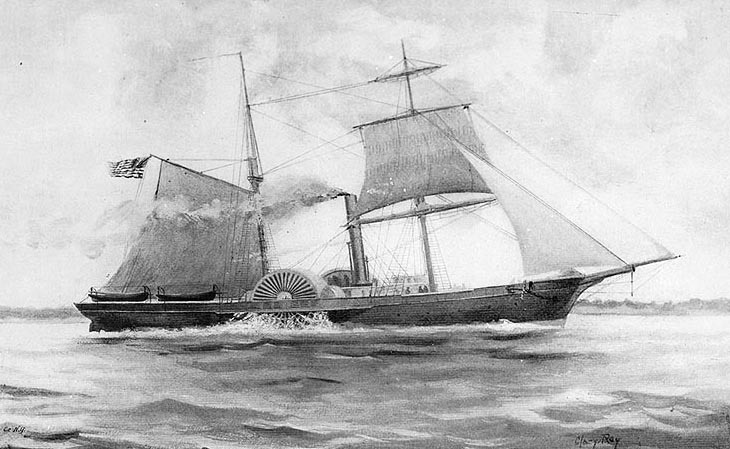 Early in 1864 the Harriet Lane was converted to a blockade runner, the Lavinia. She escaped to sea with a cargo of cotton on April 30, 1864; after her arrival in Havana, Spanish authorities detained her until the war's end. She was returned by Spain to the United States in 1867, then sold and converted to a freighter, the Elliot Richie. She met her end in a gale off Pernambuco, Brazil, on May 13, 1884. Alwyn Barr, "Texas Coastal Defense, 1861–1865," Southwestern Historical Quarterly 65 (July 1961). Civil War Naval Chronology, 1861–1865 (Washington: Naval History Division, Department of the Navy, 1961–66; rpt. 1971). Charles C. Cumberland, "The Confederate Loss and Recapture of Galveston, 1862–1863," Southwestern Historical Quarterly 51 (October 1947). H. A. Trexler, "The `Harriet Lane' and the Blockade of Galveston," Southwestern Historical Quarterly 35 (October 1931). Handbook of Texas Online, Norman C. Delaney, "HARRIET LANE," accessed April 24, 2019, http://www.tshaonline.org/handbook/online/articles/qth01. Uploaded on June 15, 2010. Modified on April 10, 2018. Published by the Texas State Historical Association.